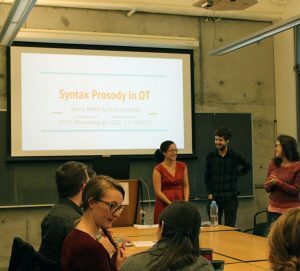 Linguistics Professors Junko Ito and Armin Mester were recently awarded a multi-year NSF grant on Syntax-Prosody in Optimality Theory (abbreviated as “SPOT”) that will propel work on the project through 2020. Within the field of linguistics, syntax and prosody are well understood concepts, but for those of us outside the field, it takes some introduction. Simply put, syntax is sentence structure, and prosody is the sound structure of spoken language. Prosody — the stress, pitch, and grouping structure (pauses) we impose through speaking — gives audible form to the abstract syntactic structure, in a way that supplies the listener with crucial cues to the intended meaning of each utterance. This NSF project aims to develop a software program called “SPOT” that aids in examining how a sentence (a syntactic structure) is related to its pronunciation (its prosodic structure). The program is open-source and available for use by anyone through a user-friendly web interface. Funds from the NSF grant will allow the project team to continue developing and refining the tool and teaching others about its potential. Although languages appear to differ endlessly, linguists have discovered an amazing uniformity in the core aspects of human language. A handful of grammatical principles explain both the universal features of language and the range of observed variation. The SPOT program under development in this NSF project can be thought of as a calculator for studying syntax-prosody interactions. As Ito and Mester explain, the tool identifies all possible prosodic realizations of a given sentence structure across languages, aiding the scholarly imagination because “our imagination just isn’t good enough to figure out all possibilities.” SPOT gives linguists a powerful tool for conducting research on how the languages of the world differ in their mapping of syntax onto prosody, and what they all have in common. Ito and Mester point out that linguists’ understanding of the syntax-prosody relation is still very incomplete and largely restricted to a few well-studied languages (such as English, French, Spanish, or Japanese), so there is a need for in-depth study of very different and less-explored languages. A researcher working on an understudied language will be able to use SPOT as a tool in forming and exploring hypotheses. Since SPOT automates many steps of the calculation, the analysis can be conducted at greater levels of depth and accuracy. The SPOT project team is currently composed of co-PIs Ito and Mester, linguistics postdoc Nick Kalivoda, and grad student researcher Jenny Bellik, who have both been working with the co-PIs from the beginning of this project and were the originators of the SPOT tool. Other linguistics graduate students will join the project in future years, and four undergraduate students (Alyssa Scarsciotti, Andrew “Wayne” Holmes, Sam Gillespie, Hoa Nguyen), who have taken advanced linguistics courses, have been brought into the project development, and are gaining experience in hands-on linguistic work and related programming that will be valuable tools in their future careers. Support from THI provided the project team with funds to host a successful SPOT workshop in Fall 2017, where the pilot SPOT program was first presented by Bellik and Kalivoda. In attendance were both senior and junior scholars working on syntax-prosody issues, which resulted in lively and productive discussions. As scholars saw the tool in action, they were able to envision how this technical innovation could expand their own research. The 2017 THI-funded workshop has already led to an invitation to Bellik and Kalivoda from the organizers of the 2018 Annual Meeting on Phonology at UC San Diego to organize a SPOT tutorial session at their venue. Additional funds from THI will enable another workshop during Spring 2019 to expand SPOT’s user base. Beyond its immediate pursuit of questions in linguistic theory and analysis, the new computational tool SPOT has possible applications in speech technology, such as improving robotic voices that don’t quite capture the cadences of natural speech. SPOT could also inform research and teaching of people learning a second language, who need to master the differences in syntax and prosody between their native language and the second language. These potential impacts inspire the project and inform the work of the researchers involved.